DataFromSky team is constantly working on developing and upgrading our software tool for advanced data visualization and interpretation DataFromSky Viewer. We have recently released a new enhanced version of this tool, including many improvements, modifications and new features! The new version of the Viewer is much more user-friendly, we have simplified the structure of the Menu and the main toolbar and make the UI easier to work with. What are the most important news and features added? Take a look at this video, where the basic system functionalities are presented to provide you quick and easy introduction to the software environment. Click on this link. 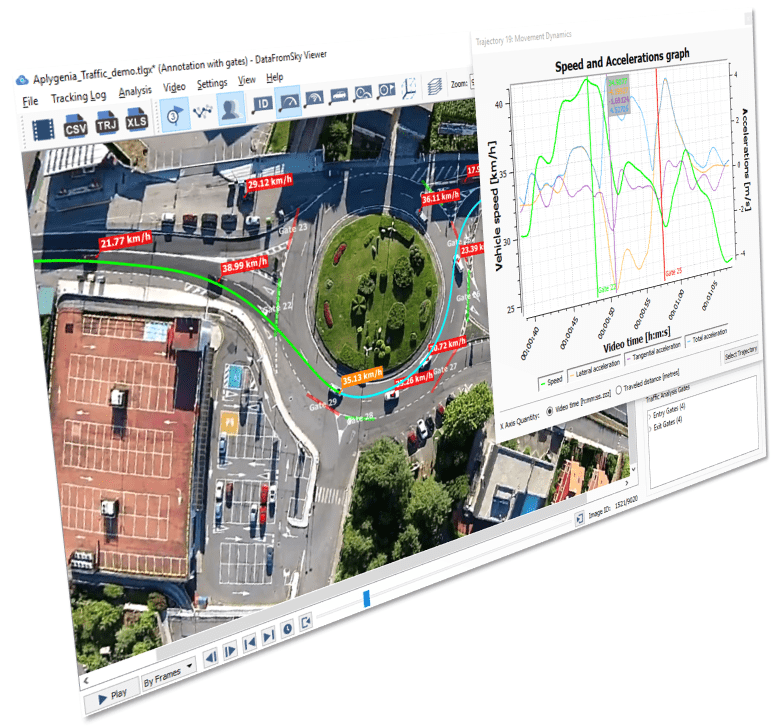 Naturally, we do not rest on our laurels and we are already working on a new version of the Viewer, which includes the advanced Safety analysis and detection of collisions and near accidents. Follow our progress! 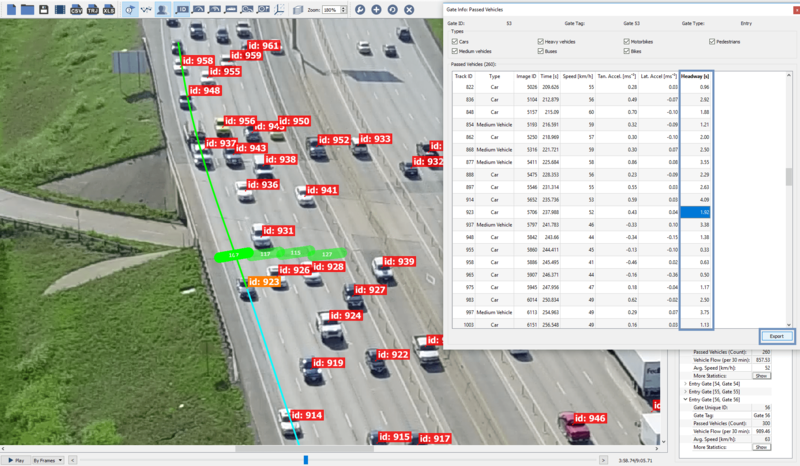 We have recently released a new enhanced version of DataFromSky Viewer! You can download the demo package at the home page. The list of differences includes a lot of things, so let’s take a look at few of them. New feature? Calculate and export headways! 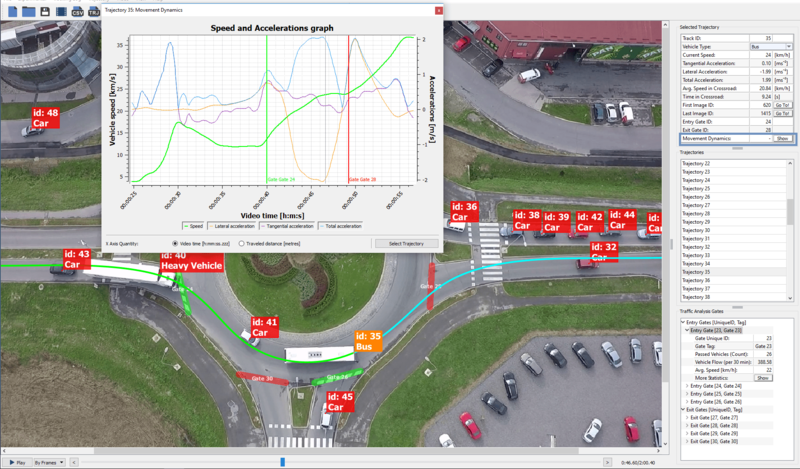 Have a look on the picture below, how to display the headway data in the Viewer. It is important to have the gates set properly per each lane to get the most accurate data. Once you have all the gates defined, choose one gate in the Traffic Analysis Gates box and click on button “Show” in More Statistics option. In a newly opened window, there is possibility to click on Calculate headways. The system will automatically calculate headways for all defined gates in the video. The headway data can be exported to the CSV file, simply by clicking on “Export”. We have visualized movement dynamics for each trajectory into a graph containing information about the vehicle’s speed and acceleration (total, lateral or tangential). This graph can be created for each selected trajectory.